A mold contamination in your Mantua, NJ home or business is not only unpleasant, but it can be very menacing and distressing. The water damage promoting the mold growth will severely undermine your building structure, compromise the structural integrity of the property, and diminish your property value. Not to mention, certain species of mold can release certain mycotoxins that can be harmful to humans. When you encounter a mold problem, your first step should be to contact a reputable mold professional to quickly and thoroughly assess the situation and implement an adequate solution. A thorough mold inspection in Mantua, NJ, conducted by a certified professional, will be able to determine if you have mold, how bad it is, how to properly get rid of it and how to prevent it from returning. When it comes to mold, MasterTech’s certified team of experts understands and appreciates the risks that mold brings to you and your family. That is why we have taken every measure to carefully train each of our inspectors and technicians to handle all cases swiftly and efficiently while remaining mindful of you and you family’s safety and best interest. At MasterTech, we pride ourselves in providing New Jersey home and business owners with a high quality, honest, and affordable mold removal service. Do you think you are detecting signs of mold development in your New Jersey home or business? You should consider calling a professional mold company in New Jersey to have your home inspected. A certified MasterTech mold inspector will complete a visual evaluation to pinpoint any conditions that can promote fungal activity. With the use of moisture meters and thermal imaging, your inspector will be able to determine all damp building materials and track the water movement patterns to isolate areas vulnerable to mold development. If necessary, samples can be collected for scientific analysis. Each MasterTech mold technician is carefully trained and equipped with the necessary skills, knowledge, and tools to properly conduct mold inspections and mold removals. At MasterTech we always have you and your family’s safety and best interest in mind. It is very important to us that we provide the safest and most effective mold removal in Mantua, NJ. 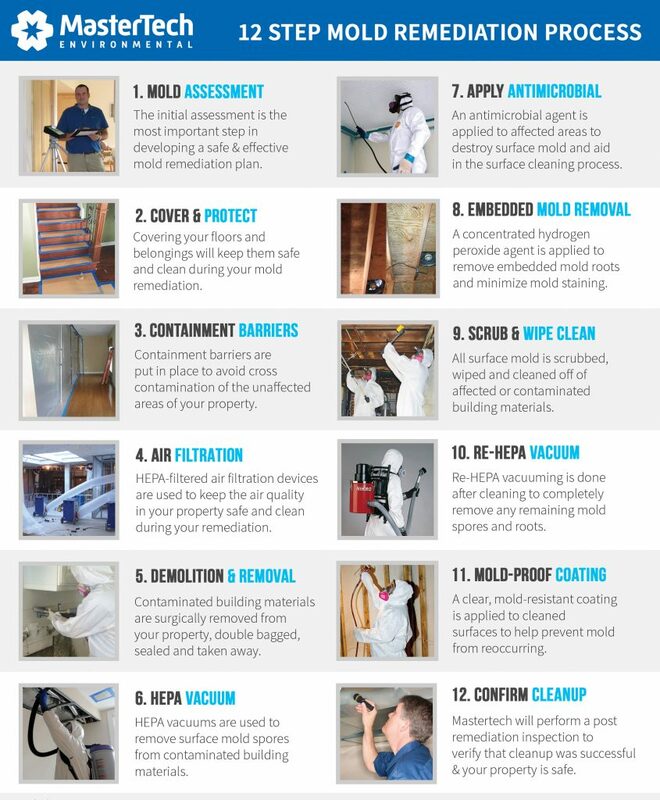 Our team of industry certified experts have made every effort strategically incorporate the safest and most up-to-date mold removal methods and equipment into our step-by-step mold removal and remediation process. Our mold remediation is broken down into 12 detailed and strategic steps to ensure that each mold remediation in Mantua, NJ is completed at the highest standard from start to finish. As proof of our commitment to doing the job right the first time, we always complete post verification testing to confirm that the job just done correctly and thoroughly. We also back every mold remediation with a 5-year mold-free warranty. It is our promise to you that the mold is gone, and it will not come back. For mold-related questions and concerns in Gloucester County, call us today. A MasterTech team member will gladly walk you through the process, go over any questions you may have, and schedule you for a mold inspection in Gloucester County, NJ. For mold inspection and mold removal National Park, NJ or mold inspection and mold remediation Woodbury Heights, NJ, call 609-948-8844.